Looking for cheap fares? Here's the latest from the biggest airline company in the country, Cebu Pacific. 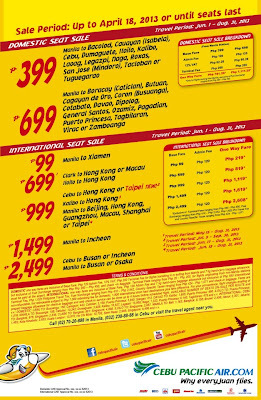 For as low as 99 pesos, travel to your favorite destination in their latest seat sale promo offer. This promo is open for both domestic and international destinations. And as mentioned, the base fare was cut to as low as 99 Pesos only. 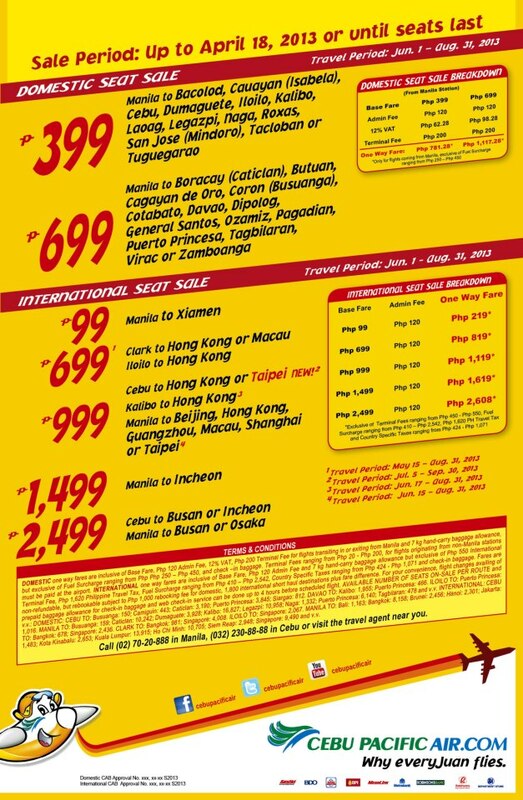 The complete list of destinations and their corresponding base fares can be found in the image below. The tickets can be purchased at www.cebupacificair.com or at the nearest payment center. The travel period for this promo is from June 1 to August 31, 2013. The promo is open until April 18, 2013 or until seats last, whichever comes first. If you purchase the ticket using someone else's credit card, make sure to bring the photocopy of the front of the card as well as the owner's ID. Although Cebu Pacific doesn't check this as far as I remember, just be ready for it to avoid inconvenience. For Philippine Airlines (PAL), this is strictly done at the check-in counter.